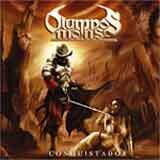 Olympos Mons is a Finnish power metal act formed in 2002 by guitarist Jari Sundström and vocalist Ian E. Highhill. Having said that, it’s probably no surprise that strong influences from Nocturnal Rites, Stratovarius, and others can be heard in the band’s music. I should caveat that statement by also pointing out that the band is trying to establish its own sound. The band succeeds on this level with certain songs more than others, while all songs are well played and written. Last year, the band signed a contract with Limb Music, who is releasing the band’s debut album, Conquistador. This is a solid debut album by all means, making Olympos Mons a band that I will keep and eye on in the future. The opening track, Seven Seas is an upbeat, mid paced song that features the clever use of bagpipes throughout the song. Combined with the thick, full bodied guitar tone that engulfs the entire album, the soundscape created on this opening track is huge. This song left me very excited about the rest of the album. Unfortunately, this song is the most adventurous of the album. The remaining songs are certainly of high quality, but I was hoping they would also be as adventurous as the opening track. I am hoping that the band expands on these ideas in the future, as it will surely give the band an identity in what is now a very crowded power metal genre. Olympos Mons deliver hard hitting, crunchy, and sometimes aggressive riffs throughout the album. This provides a nice balance against the upbeat melodies and chorus lines. As I mentioned previously, the guitar tone is very thick, with an adequate and authoritative bass presence. While listening to this album, the guitar work reminds of Grave Digger’s The Grave Digger album on several occasions. There is a large group of fans that detest happy and uplifting power metal, but when backed up with ballsy guitar work such as this album, I find the result to be quite enjoyable. Through the Ice And Snow is an energetic, power metal anthem backed by a neoclassical keyboard run throughout. This song captures my favorite elements of Stratovarius’ Visions album, something that even Stratovarius has been unable to do since the release of that album. Lady in White in majestic cut that starts off with a bombastic keyboard and flute dominated intro, but then explodes into a speedy, melodic anthem that will burn its way into your memory with its chorus lines, and surprise you with a couple of time changes and deviations in tempo. Conquistador is a 10+ minute epic that closes the album. This track features the use of a harp, well placed keyboard textures, and some darker passages in addition to the familiar dose of melodic power metal that you have become accustomed to by this point in the album. The diversity displayed in this track makes for an interesting listen, and manages to avoid repetitiveness. Even though Olympos Mons is another addition to a very crowded power metal genre, I feel this band is one to keep an eye on. The guitar work is above average, and the band seems willing to explore new avenues as far as songwriting goes. Hopefully, the band will further explore the use of instruments such as the bagpipes, harp, flute, and neoclassical keyboard passages in the future. When used, these elements color the songs with a lot of personality, something that will be needed in order to avoid the cookie cutter mold of power metal bands out there. Vocalist Ian E. Highhill does an admirable job behind the mic. His voice is clean and melodic, primarily singing in the higher registers. None of the songs on the album is a sloucher, but the more adventurous cuts that beat a path away from conventional sounds clearly stand out. Two thumbs up for this solid debut album.